Engaged! This is my biggest news! It was more a matter of ordering and waiting for the engagement rings and then finding the right circumstances. We both ordered rings for each other but because of the uncertainty of when each would arrive and therefore when to officially propose, it was a bit awkward to know when to propose to each other. My partner solved that problem. She unexpected asked if I would like to go out to eat at this restaurant we had talked about but never tried. We do not go out to eat that often and this surprised me (usually I’m the one twisting her arm to go out). Well, she drove right past the place with the excuse that we were a bit early for our reservation and suggested we sit at a bench at one of the beaches close by. We sat on a hill overlooking Polo beach. We were just talking when I felt something being pushed against my leg. I was almost going to complain to her about poking me when I looked down and noticed she was pushing a present to me! It was a cloth clutch for carrying jewelry on trips (separate compartments to keep everything from tangling horribly). I had been looking for one, so this was a nice surprise. But then she said “open it and look inside” – there in a pouch was an engagement ring! I had wondered if I would cry when she proposed to me – now I know – I did! It was so beautiful and in such a perfect place and setting. Then it was my turn: so in one graceful motion, I pulled out her engagement ring, slid off the bench onto one knee and proposed to her. It’s now official – we are engaged. Oh, the restaurant – it was wonderful – shared the best wine – Greek cuisine – and had heart shaped chocolates from the shop next door! The wedding day has been confirmed: May 4th, 2014. I’m excited to be doing the wedding planning. I have the officiate confirmed (Rev Kimo), it will be a Hawaiian ceremony. We have decided on our flowers, the main outline of our ceremony (on the beach of course) and have formally submitted our marriage applications to the State. I bought another dress – the other one was just a bit too much for a beach wedding. My ‘sista’ at work sews and will tailor this if needed. So far, with a little more weight loss, it should fit fine. This one is a beautiful white dress with embossed white flowers. It is a type of Hawaiian holoku dress. It is prefect for Hawaii and for the beach. I’ll be wearing a haku (head crown) and kupe’e (wrist and ankle) leis and a neck lei all of baby white orchids and Hawaiian ferns. I found some white satin sandals that I have yet to buy. I still have to decide on earrings, necklace and a cascading bouquet. We are making our own invitations and will be printing and sending them out shortly. We traveled back to southern California again – cleaning up and getting that house ready for market. My partner had a number of ‘estate executor’ duties – lot’s of people to see and business to take care of. We rented a large dumpster and before we left, we had it 1/2 filled. Lots of moving furniture and hauling things around – just like when I helped move the data center here – lifting all that weight is building up the wrong muscles … don’t exactly want large upper arms! Like our plane trip before, I’m getting used to being ‘massively’ out in public, I have a lot more confidence and am much more at ease in public, in airports, on the plane or just traveling in general. I can look back and see how scared and uneasy I was before. We’ll laugh about how it was at first (easy to do now – but oh boy, back then). I’ve been expanding my wardrobe again (but of course, this woman loves to shop!). I bought more shoes: very nice sandals, wedges and white comfortable flats. My partner, my therapist, my ‘sista’ at work plus a number of others have been admiring my legs and twisting my arm to get shorts – short shorts, short skirts, etc. Very seldom have I worn shorts before. So I gave in – I bought short short jeans and also a skirt. My partner loved the jeans and insisted I get a couple more – so I bought an even shorter one. I do admit, I look better that I thought I would. I also found this beautiful white print tank top. It has a matching shorts and a hoodie. 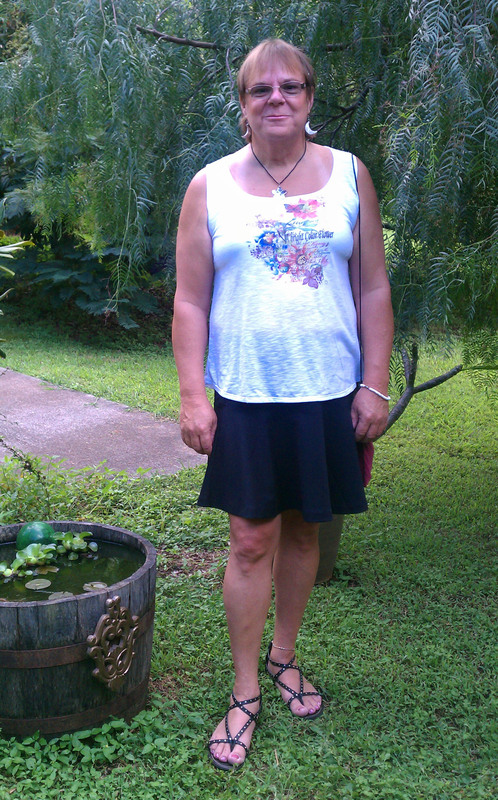 I’m wearing the skirt, the tank top and my new sandals in the picture above. Oh and just today my swimsuit bottoms came in: black skirted/ruched bikini bottoms. I can’t wait to get to the beach this weekend – we are going to check out White Rock beach where we are going to have our wedding. For valentines day I went around the house taking pictures of flowers, a Buddha statue, etc., then came up with romantic sayings for each one, printed these out (about 1/2 dozen) and then ‘hid’ them around the house for my partner to find (under her keyboard, in the fridge, next to her pillow, inside her book at the page she was reading …). We had little ‘squeals’ all day long! I had saved one for when we went out and snuck it into her menu. Valentines day is my favorite of all the celebrations in a year. I record and webcast our monthly astronomy talks. At last months talk, a good friend of mine (he runs the local amateur astronomy club) came up as usual to say hi and chat. We usually hug, but this time he turned and kissed me on the cheek!!! He is awesome and I guess I’ve come a long way. But I do understand why women complain about men having stubbly 5 o’clock shadows….. Also the director of astronomy made a special trip to the back of the room where I was with the equipment just to give me a huge hug and make sure I was doing ok. He has helped immensely in making my work transition go smoothly. What a guy, wow! I have started electrolysis at last. I go once a week for one hour. I have heard so many people talk about their experiences, some very scary, some ok. My laser treatment did take out some of the hair – but mostly it turned the rest white, which of course laser can not help (my hair was quite dark). So I had no choice but to have electrolysis on the rest. One good thing from the laser treatment is that the white hair is hardly noticeable and I can go without shaving for a couple of days. So, in hindsight, if I would have known this, would I still have had the laser treatment – hummm – too close to call but I think so. It is very important to have a good technician for electrolysis however. I see a technician that is independent – not connected to a large organization. I have heard lots about how organizations set policies on how much, how fast etc and this usually translates to either having hair grow back or having scars. The person I go to will adjust the settings for the different skin areas and sensitivities. She is well trained and good. Mostly it feels like someone is ‘pulling’ on my face hairs (some describe it as a mild bee sting – it does not feel even that bad). She uses a topical medication to numb the area – so no injections. I barely feel the electrolysis needle going in, then a bit of a pull sensation as the current is applied and I usually do not feel anything when she pulls the follicle out. For me, the hardest (and most sensitive) area is just under the nose. She will only do a few at a time up there, then pull somewhere else, then come back … etc. Now everyone is different, but perhaps if you were thinking of electrolysis this might help you. My breasts are growing again, still have growing pains/tenderness now and then. They are very firm now. My partner even noticed the growth and said something to me. They are also ‘bouncing’ a lot more – she commented on that too. My only concern is that they are wide apart (wide cleavage). I read this one web site where they had a questionnaire about your bra fitting and issues you had, then recommended the style and size of bra you should wear. So, I need ‘side’ control: bras with wide side panels that contour and shape my breasts back to the front. Other physical changes of note include my face changing again (it’s not as round), more noticeable curves (finally getting a waist and my bottom is a bit larger…). My hair is longer, I love the little flip down by my shoulders. I’ve had three stylings now and my hair is slowly taking shape. My partner is jealous of my hair – it’s fine, straight and behaves well when styled. Oh, and there have also been comments made about me being a bit emotional or too sensitive – comments about my estrogen levels. Of course I don’t know what they are talking about …! Last big bit of news is that I’ve finally made a decision as to which doctor/clinic I will have my SRS at. I have chosen Dr. Suporn in Thailand. My therapist has signed my letter authorizing my surgery and I’ll will be submitting that plus the medical questionnaire to his office later this week. I’m look at scheduling this around late Sept. this year. Posted in About, Diary and tagged Being Female, Gender Change, MTF, Transgender, Transition, Transsexual. Bookmark the permalink. Sifan, you look very happy and relaxed. Julia and I are so looking forward to seeing you and Lisa in May. May you enjoy every moment preparing for your big day!